PPHS senior Cason Payne (7) dives across the goal line for the final touchdown of the Big Blacks’ 41-34 victory on Friday in Point Pleasant, W.Va.
POINT PLEASANT, W.Va. —Big Blacks make big plays. Whether it was an eight-yard touchdown run to tie the game just before the half, a 14-yard scoring run to break a tie with 2:12 left in regulation, or fourth down pass deflection in the end zone on to seal the win, the Point Pleasant football team did whatever it took to claim a 41-34 victory over visiting Pikeville on Friday night at Ohio Valley Bank Track and Field. 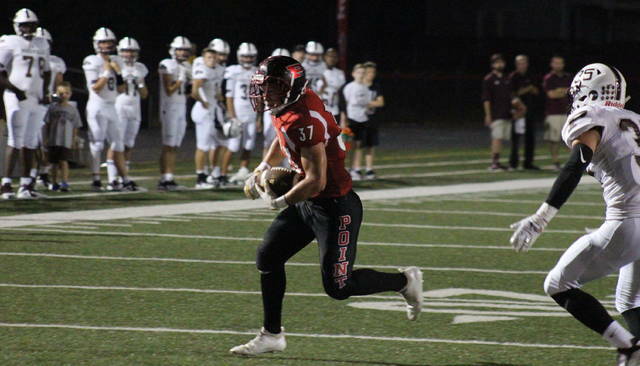 Point Pleasant (5-0) took a 7-0 lead on its first possession of the game, as senior quarterback Cason Payne scored on a five-yard run, and Oliver Skeie made his first of four straight extra-point kicks. PPHS added on to its lead as time expired in the first quarter, with Brady Adkins diving across the goal line at the end of a 10-yard run. The Panthers (3-2) got on the board for the first time with 8:20 left in the second quarter, as Zack Roberts scored on a one-yard run. Tanner Hamilton made his first of three straight point-after kicks to cut the PPHS lead to 14-7. Pikeville tied the game with 4:53 left in the half, as Kyle Watking hauled in a 10-yard scoring pass from Conner Roberts. The guests took their first and only lead of the night with 2:07 left in the half, as Jackson Hensley made a leaping grab for a 20-yard touchdown pass from Conner Roberts. Point Pleasant’s offense snapped out of its cold spell and covered 74 yards in the next 1:53. With just 14 seconds left in the half, Payne dove to the corner of the end zone, capping off the drive and tying the game at 21 with an eight-yard scoring run. The Big Blacks regained the lead on their first drive of the second half, which Adkins capped off by stretching the ball across the goal line at the end of a three-yard run with 6:21 left in the quarter. Pikeville had an answer on its first possession of the half, as Conner Roberts connected with Jackson Hensley for a 54-yard scoring pass. The point-after kick missed, however, leaving the Big Blacks with a 28-27 advantage. Point Pleasant’s next drive took the game into its final quarter, and the hosts’ lead was increased to 34-27 with 11:15 left in regulation, as Payne dove into the middle of the end zone from two-yards out. Pikeville again answered the Big Blacks’ score, with Zack Roberts finding paydirt from one yard out to at the end of a 4:14 drive. Hamilton’s extra-point kick tied the game at 34 with 7:01 to play. 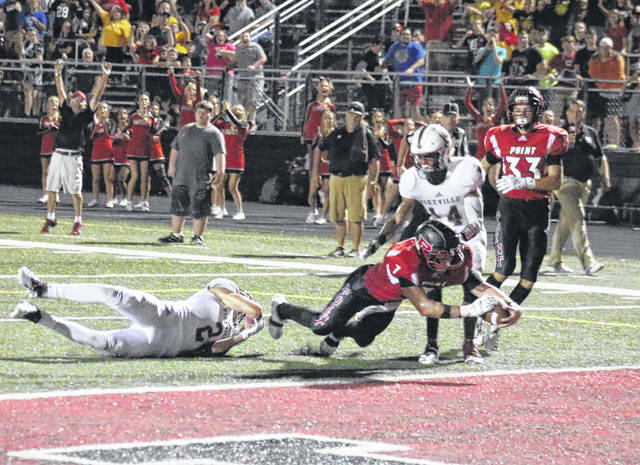 The Big Blacks were forced to punt on their next possession, but the Point Pleasant defense provided the stop it needed, and Pikeville punted the ball back to the hosts. 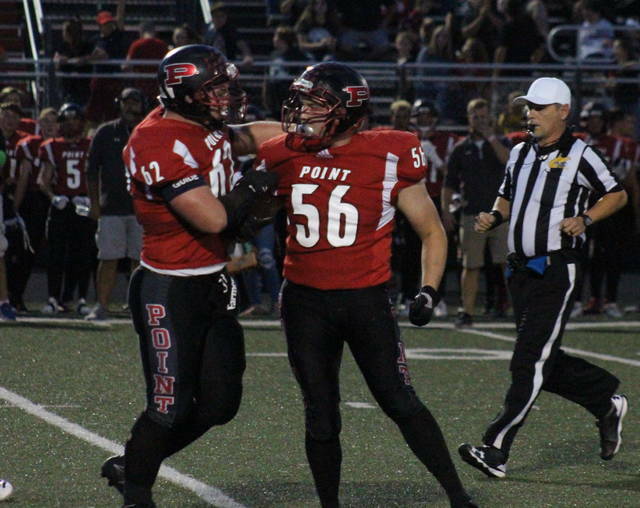 Starting its drive just on the Pikeville side of the 50, Point Pleasant ran as much time off the clock as it could before Payne broke a 14-yard touchdown run, reestablishing the PPHS lead with 2:12 left in regulation. The guests drove from their own side of the field down to the PPHS 3-yard line, where they faced a fourth-and-goal with 37 seconds remaining. The Pikeville pass attempt was swatted away by Point Pleasant junior Jovone Johnson, sealing the Big Blacks’ 41-34 victory. Following the hard-fought triumph, 12th-year PPHS head coach David Darst was pleased with the way his team responded against such a quality opponent. “What a great football team we just saw, there’s a reason they’re ranked No. 1 in Kentucky,” Darst said. “Those guys brought the game to us tonight, and our guys responded the way I wanted to see them respond. We never quit, we stayed in the game, our offense responded when it needed to respond, and our defense made a huge play when it needed to be made. 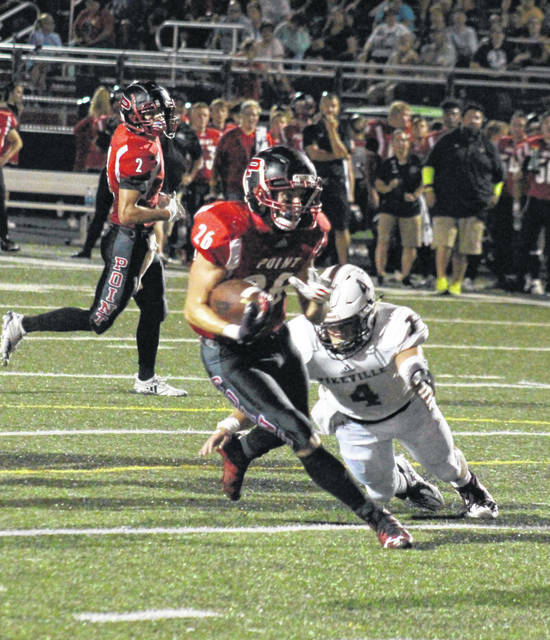 The Panthers enjoyed an advantage of 503-to-438 in total offense, despite Point Pleasant earning a 271-to-166 advantage in rushing yards and a 25-to-24 edge in first downs. Neither team committed a turnover in the contest, and both squads were penalized six times, PPHS for 30 yards and PHS for 40. Payne was 19-of-26 passing for 167 yards, while leading all rushers with 131 yards and four touchdowns on 21 carries. Adkins earned 116 yards and two touchdowns on 14 carries, while hauling in four passes for 37 yards. Josh Wamsley had a game-high eight receptions for 89 yards, while earning one yard over a pair of carries. Nick Parsons gained 23 yards on five carries, Joel Beattie had 20 yards on a trio of receptions, while Andrew Jones caught two passes for 17 yards, and James Musgrave had one grab for four yards. Payne, Johnson and Wyatt Wilson led the Point Pleasant defensive effort in the win. Conner Roberts — who led Pikeville on the ground with 88 yards over 13 tries — was 18-of-32 passing for 337 yards and three touchdowns. Christian Billiter led the Panther receiving unit with six receptions for 129 yards. Point Pleasant has back-to-back bye weeks before returning to the field at Meigs on Oct. 12. “Now we have a couple weeks to recover and refocus, and that’s what we’re going to do,” Darst said. “We’re going to go to boot camp, we’re going to get in here and work on fitness, and we’re going work on getting better. The Big Blacks have earned a trip to the postseason in each of the last 10 seasons and have a postseason victory in five straight years. This was the first-ever meeting between these schools. This was the second straight year in PPHS earned victory when televised live on WCHS-TV as its weekly Wendy’s Friday Night Rivals Game of the Week in West Virginia, and Payne repeated as the game’s Most Valuable Player.